Ken Glowacki, LAc, is an assistant professor at NUNM’s College of Classical Chinese Medicine. Previously, he was chair of acupuncture, bodywork and qi cultivation at Oregon College of Oriental Medicine where he was responsible for curriculum development, faculty support and development, and student educational issues. 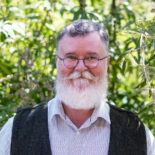 Ken received his Master of Education degree from the Monterey Institute of International Studies in Monterey, California, and holds a Master of Science in Traditional Oriental Medicine degree from Pacific College of Oriental Medicine, in San Diego, California. He has trained in a broad range of acupuncture styles, including extensive study in Japan with leading Daoist educator Dr. Jeffrey C. Yuan. Ken has presented, taught and lectured at numerous conferences, trainings and seminars in the U.S.